Download "SCOPE OF PRACTICE FOR ARNPS"
1 FLORIDA'S PROHIBITION ON ADVANCED REGISTERED NURSE PRACTITIONERS (ARNPs) PRESCRIBING CONTROLLED SUBSTANCES AND THE REQUIREMENTS TO REPORT SUCH ACTIVITY Florida is one of the two states that does not allow advanced registered nurse practitioners (ARNPs) to prescribe controlled substances such as narcotics. Provided the ARNPs protocol with her or his supervising physicians allows it, the ARNP may prescribe other medications which are not controlled substances. SCOPE OF PRACTICE FOR ARNPS Licensed practical nurses (LPNs), RNs and ARNPs are all licensed by the Board of Nursing and regulated by Chapters 456 and 464, Florida Statutes. It is beyond the scope of practice and a violation of Section (3), Florida Statutes (the Nurse Practice Act) for a registered nurse (RN) or an ARNP in Florida to prescribe any controlled substance in Florida. 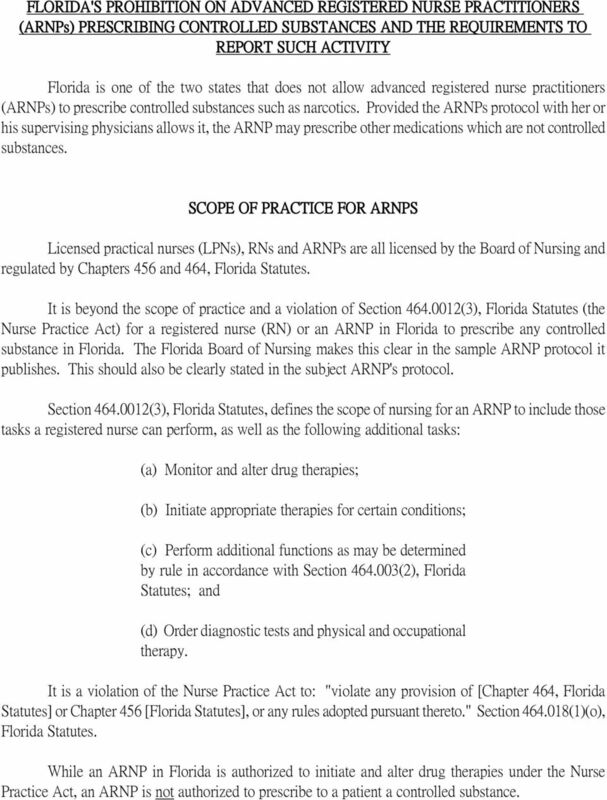 The Florida Board of Nursing makes this clear in the sample ARNP protocol it publishes. This should also be clearly stated in the subject ARNP's protocol. 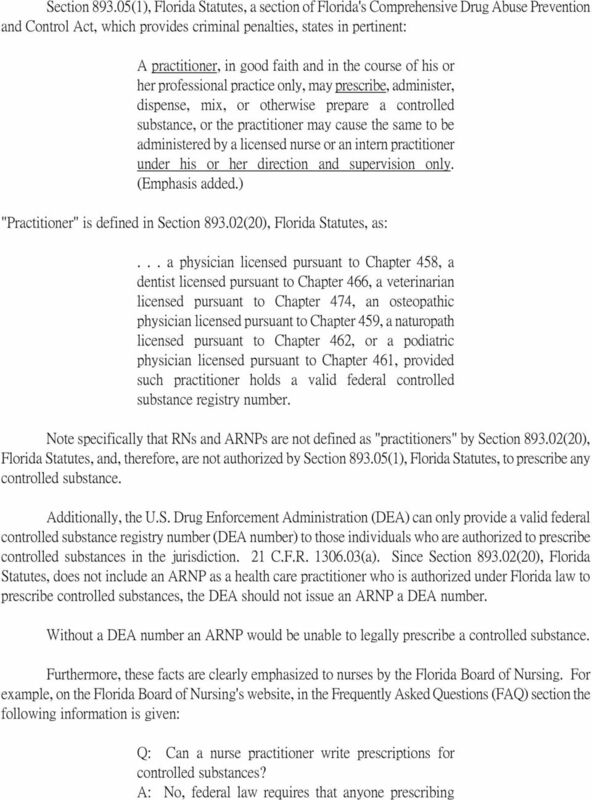 Section (3), Florida Statutes, defines the scope of nursing for an ARNP to include those tasks a registered nurse can perform, as well as the following additional tasks: (a) Monitor and alter drug therapies; (b) Initiate appropriate therapies for certain conditions; (c) Perform additional functions as may be determined by rule in accordance with Section (2), Florida Statutes; and (d) Order diagnostic tests and physical and occupational therapy. 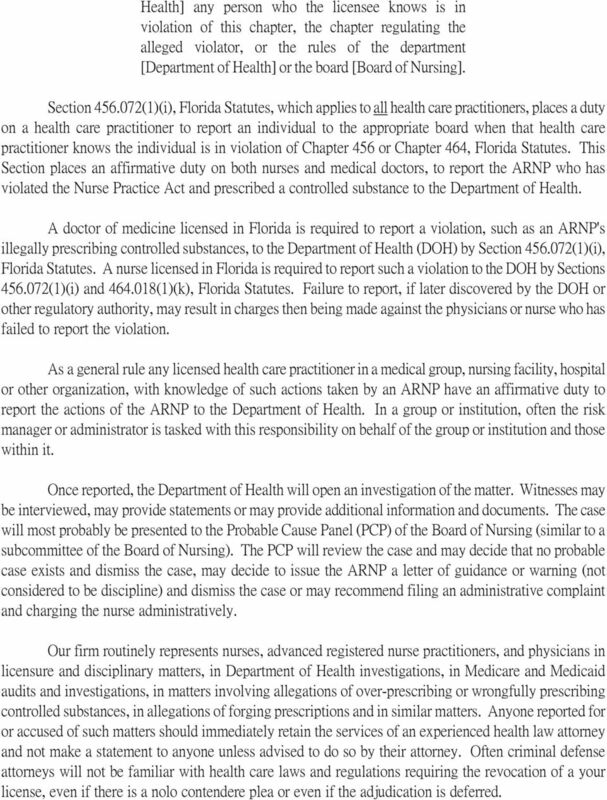 It is a violation of the Nurse Practice Act to: "violate any provision of [Chapter 464, Florida Statutes] or Chapter 456 [Florida Statutes], or any rules adopted pursuant thereto." Section (1)(o), Florida Statutes. 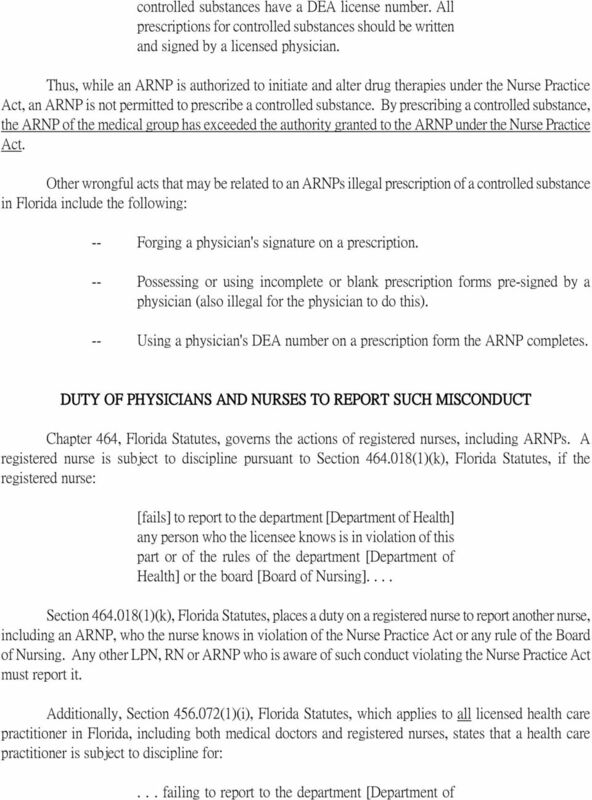 While an ARNP in Florida is authorized to initiate and alter drug therapies under the Nurse Practice Act, an ARNP is not authorized to prescribe to a patient a controlled substance. 4 Health] any person who the licensee knows is in violation of this chapter, the chapter regulating the alleged violator, or the rules of the department [Department of Health] or the board [Board of Nursing]. Section (1)(i), Florida Statutes, which applies to all health care practitioners, places a duty on a health care practitioner to report an individual to the appropriate board when that health care practitioner knows the individual is in violation of Chapter 456 or Chapter 464, Florida Statutes. This Section places an affirmative duty on both nurses and medical doctors, to report the ARNP who has violated the Nurse Practice Act and prescribed a controlled substance to the Department of Health. A doctor of medicine licensed in Florida is required to report a violation, such as an ARNP's illegally prescribing controlled substances, to the Department of Health (DOH) by Section (1)(i), Florida Statutes. A nurse licensed in Florida is required to report such a violation to the DOH by Sections (1)(i) and (1)(k), Florida Statutes. Failure to report, if later discovered by the DOH or other regulatory authority, may result in charges then being made against the physicians or nurse who has failed to report the violation. As a general rule any licensed health care practitioner in a medical group, nursing facility, hospital or other organization, with knowledge of such actions taken by an ARNP have an affirmative duty to report the actions of the ARNP to the Department of Health. In a group or institution, often the risk manager or administrator is tasked with this responsibility on behalf of the group or institution and those within it. Once reported, the Department of Health will open an investigation of the matter. Witnesses may be interviewed, may provide statements or may provide additional information and documents. The case will most probably be presented to the Probable Cause Panel (PCP) of the Board of Nursing (similar to a subcommittee of the Board of Nursing). The PCP will review the case and may decide that no probable case exists and dismiss the case, may decide to issue the ARNP a letter of guidance or warning (not considered to be discipline) and dismiss the case or may recommend filing an administrative complaint and charging the nurse administratively. Our firm routinely represents nurses, advanced registered nurse practitioners, and physicians in licensure and disciplinary matters, in Department of Health investigations, in Medicare and Medicaid audits and investigations, in matters involving allegations of over-prescribing or wrongfully prescribing controlled substances, in allegations of forging prescriptions and in similar matters. Anyone reported for or accused of such matters should immediately retain the services of an experienced health law attorney and not make a statement to anyone unless advised to do so by their attorney. Often criminal defense attorneys will not be familiar with health care laws and regulations requiring the revocation of a your license, even if there is a nolo contendere plea or even if the adjudication is deferred. 4/28/2014. The Nurse Practice Act is not a technical document that provides instructions and standards for performing specific nursing actions. CHAPTER 2010-211. Committee Substitute for Committee Substitute for Senate Bill No. 2272 and Committee Substitute for Senate Bill No. CHAPTER 10 GUAM BOARD OF ALLIED HEALTH EXAMINERS 10101. Definitions 10102. Requirements for Licensure. 10103. Supervising Physician. 10104. Registration of Physician Assistants Supervision. 10105. Re-Certification. CHAPTER 19 THE INTERVENTION PROJECT FOR NURSES (IPN) SUBSTANCE ABUSE, REHABILITATION AND DISCIPLINE I. INTRODUCTION Nurses and other medical professionals are constantly faced with high-stress situations. AN INFORMATION GUIDE FOR ALABAMA MEDICAL LICENSEES: THE ALABAMA BOARD OF MEDICAL EXAMINERS AND THE MEDICAL LICENSURE COMMISSION OF ALABAMA Originally written for Alabama licensed physicians by Arthur F.